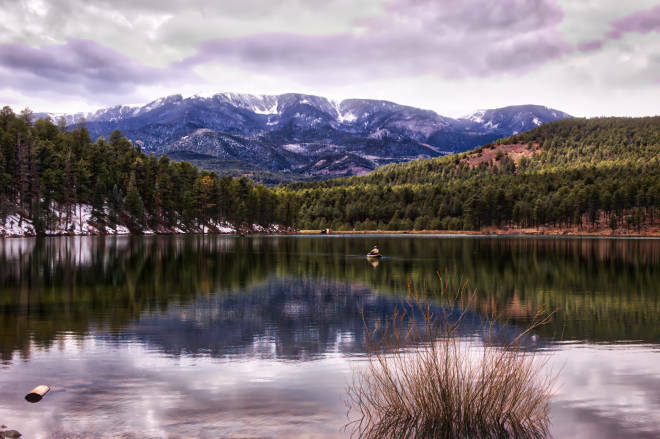 Above: Morphy Lake State Park, courtesy of New Mexico State Parks/James Foley. Want to sleep under the stars? Try the mind-blowing Milky Way views from a certified Dark Sky Sanctuary. You can camp beside wildflower meadows or among volcanic rock columns, on the ghostly gypsum dunes at White Sands or the forested slopes of the Pecos Wilderness. Best of all, these 10 perfect places to pitch a tent are all easily accessible by car—no epic backpacking treks required. This summer, the sky’s the limit. Brushy Point Campground at Heron Lake. Throw open your rain fly at Brushy Point, and you’ll find a view more refreshing than your morning coffee: fields of golden sunflowers stretching nearly to the shore of Heron Lake. 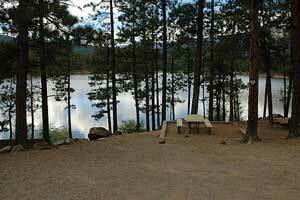 Pull up a chair beneath a juniper at your campsite to watch for osprey and bald eagles hunting salmon. If you plan to get on the water yourself, come ready to row—this tranquil no-wake lake is popular for kayaking and paddle- boarding. For hikers, the 5.5-mile Río Chama trail leads across a suspension bridge to the shale shores of a sister lake, El Vado, where motorized boating is allowed. 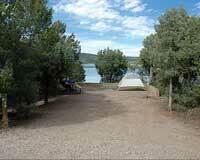 You won’t find much seclusion at this popular spot, where the campground is regularly packed with tents and RVs. But even during the height of summer, you can nestle your tent in shaded pine and spruce forest and fall asleep to the gentle sounds of Columbine Creek, which flows past the campsites to the Red River. The forest floor is dotted with bright red thimbleberry flowers and the yellow columbine that gives the canyon its name. For a morning hike, hit the Columbine-Twining National Recreation Trail, which leads the few miles to the Columbine Hondo Wilderness Area. If you register in advance for a llama trek with Wild Earth Llama Adventures (llamaadventures.com), a cordial camelid will carry your pack along this trail to a lunch spot in a wildflower meadow. NOTE: Weather conditions and campsite availability vary, so be sure to call ahead for the latest info. Also, due to the remoteness of some of these sites, don’t forget to come well equipped and ready for a wilderness experience. In the cool waters below Navajo Dam, trout find their perfect habitat, and fishermen find world-class conditions for their sport. Come fall, campers at Cottonwood Campground are angling for something else: a spot near the golden cottonwoods that emblazon this valley. Pitch your tent beneath the shimmering leaves and enjoy the crisp autumn air along the sandy banks of the San Juan River. For those packing tackle, the trout-rich Quality Waters are just a short walk away. The Gila National Forest’s remote setting—far from urban light pollution—makes it a perfect place for stargazing. In January 2016, the International Dark-Sky Association named the Gila’s Cosmic Campground the first Dark Sky Sanctuary in the U.S. Forest Service system. (The association awards the designation only to places with exceptionally starry nights, hoping to protect their scientific, natural, and cultural value.) At this high-desert campground, the number of tent sites—four, with a few more for RVs—corresponds to the number of concrete pads where hobby astronomers can set up their telescopes for unrivaled views of the Milky Way. Even with the naked eye, you can enjoy heavenly views here; the most prominent constellations are nearly lost in a sea of pinprick lights that remind us of our place in the universe. A stargazing party is planned for June 4. The Pecos is a gem among New Mexico’s wild places, and this campground is a treasure. Set among the pines along Panchuela Creek, the campsites here get high marks for scenery. The location’s not too shabby, either, next door to the state’s second-largest wilderness area and its more than 200,000 acres of forested slopes, alpine peaks, and wildflower meadows. Streams rush through many of Santa Fe National Forest’s canyons, lending the area an especially lush feel, rich with ferns and knee-high grasses. Anglers camping here can fish Panchuela Creek and other nearby streams for rainbow and Río Grande cutthroat trout. For hikers, the Cave Creek Trail leads directly from the campsite to a trio of small caves several miles upstream (don’t forget to bring a headlamp). In this natural “city,” the skyscrapers are rock columns as tall as 40 feet, formed by a volcanic explosion some 35 million years ago and sculpted over time. There are no sprawling campgrounds here; rather, 52 individual sites are scattered in scenic spots among the boulders. Gabriel Medrano, the park manager, says Site 22 is especially convenient for its arrangement of rocks that make tent setup easy. That site and others, such as 28 and 29, are situated beside popular hiking and mountain biking trails. Plan your trip for spring and fall for the best weather; summer can be hot here, and the landscape is rather exposed. Sitting Bull Falls is a popular favorite in Carlsbad, and no wonder. The day-use area’s marquee attraction is a 150-foot cascade that tumbles down fern-covered cliffs into shallow pools. Madrone trees, with their rust-colored bark, add pops of color to the landscape. Although there’s no camping at the falls, dispersed camping is possible just outside the gates. Half a mile before the recreation area, in Last Chance Canyon, campers have established sites and fire rings. You’ll be close enough to beat the crowds to the falls—some visitors line up as early as 6 a.m. to ensure they can get their favorite picnic sites, as the area is popular for family reunions and birthday parties. In the years since a wildfire damaged the vicinity in 2011, the trails and viewing plat- form have been completely rebuilt and new deciduous trees have been planted. A half-mile-long wheelchair-accessible trail leads to the pools; a longer hike ascends to the spring that feeds the falls. A Picnic area at Morphy Lake State Park. Tight turns make this state park difficult to reach for RVs, but as a result it’s a haven for tent camping. Morphy Lake is small—only 15 watery acres—but its setting in a valley shaded by ponderosas gives the park an intimate feel. Campsites perch along the lake under towering trees, spaced so that campers aren’t too cozy with their neighbors. Each site has a view to the water, and many have access to good canoe launch sites. Although the lake is open year-round (to accommodate ice-fishing in winter), the campsites are only accessible April 1 to November 1. Aguirre Spring Campground, on the eastern side of the Organ Mountains. The Organ Mountains–Desert Peaks National Monument preserves nearly half a million acres of rocky peaks and narrow canyons, much of it in Las Cruces’s backyard. Aguirre Spring Campground has the convenience of being close to the state’s second-largest city, yet its location on the east side of the mountains makes the site feel remote. Here the Organs’ stunning panorama of needle-like spires rises just outside your tent. 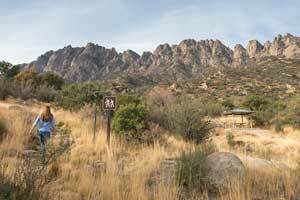 The mountains seem to hug the campground, protecting the Chihuahuan Desert ecosystem of yucca, juniper, and sage. It’s some of the best desert camping in the state. Two trails depart from the site: The six-mile Baylor Pass Trail climbs to a saddle with views of the Mesilla Valley, while the four-mile Pine Tree Trail forms a loop at the base of the mountains. 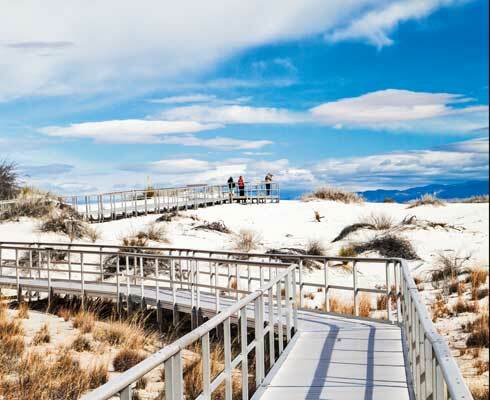 New Mexico lays claim to the largest gypsum dune field in the world, and you can camp amid its stunning alabaster hills. There are no official campgrounds or RV sites within the park (there are several close by, including at Aguirre Spring Recreation Area—see above). Even in this minimalist landscape—275 square miles of sparsely vegetated snow-white sands—wildlife abounds. Campers are welcome anywhere along the 2.2-mile Backcountry Loop. The first campsite is three-quarters of a mile from the trailhead; any of them will give you a front-row seat to the park’s spectacular—and highly photogenic—sunsets and sunrises. SPECIAL NOTES: In addition to monument entrance fees, a permit is required for backcountry camping. Campers must register for one of 10 sites (available on a first-come, first-served basis) at least one hour before sunset. The monument is periodically closed for missile testing on the adjacent White Sands Missile Range, so call ahead to verify that it’s open. Contributor Ashley M. Biggers is the author of a forthcoming book on eco-travel in New Mexico.